Did Spencer Ackerman Get Beaten Up Enough As A Kid? “From a military perspective, Hoth should have been a total debacle for the Rebel Alliance…. The defenses the Alliance constructed on Hoth could not be more favorable to Vader if the villain constructed them himself. The single Rebel base (!) 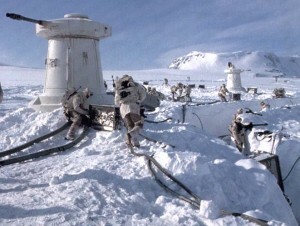 is defended by a few artillery pieces on its north slope, protecting its main power generator. An ion cannon is its main anti-aircraft/spacecraft defense. Its outermost perimeter defense is an energy shield that can deflect Imperial laser bombardment. But the shield has two huge flaws: It can’t stop an Imperial landing force from entering the atmosphere, and it can only open in a discrete place for a limited time so the Rebels’ Ion Cannon can protect an evacuation. In essence, the Rebels built a shield that can’t keep an invader out and complicates their own escape. — When you’re finished arguing about whether or not the dude on “Girls” was way too attractive to hook up with Lena Dunham, you can move on to this.